1947 Simplicity #1906 vintage sewing pattern, misses' back-buttoning blouse in four styles, plus size 18. The back-buttoning blouse is fitted with tucks and dart tucks at the front and back lower edges. A forward shoulder seam releases soft fullness in the blouse front. 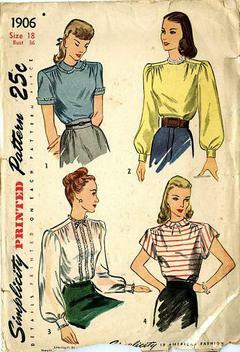 Styles 1 and 4 have a Peter Pan collar and the sleeve may be short or capped. Lace edging is optional. Styles 2 and 3 have bishop sleeves that are gathered at the uper edge.